Stephen L. "Steve" Searl was born February 9, 1862, in Franklin Twp., DeKalb Co., IL, and died 1940 in Solomon Twp., Graham Co., KS, due to a stroke, at about age 78. Buried in Morland Cemetery, Graham Co., KS. He is the son of John Searl of Broadoak (Braddock) Parish, County Cornwall, England and Elizabeth "Eliza" Bailey of Ireland. Hannah E. "Jennie" Hockersmith was born April 9, 1863, in Frankfort, Carroll Co., KY, and died January 1, 1924, in Pontiac, Livingston Co., IL, at age 60. Buried in Morland Cemetery, Graham Co., KS. She is the daughter of Joseph C. "Joe" Hockersmith of Kentucky, and Winifred Ann "Winnie" Malin of Kentucky. Her parent's marriage ended in divorce. Stephen L. "Steve" Searl and Hannah E. "Jennie" Hockersmith were married December 25, 1888, at the home of the bride's parents, Morland, Graham Co., KS. Anna W. "Annie" Searl: Born November 23, 1889, in Morland, Solomon Co., KS; Died August 15, 1969, in Urbana, Champaign Co., IL (age 79). Never married. In 1940, Anna was Assistant State Leader and Assistant Professor, Home Economics Extension, University of Illinois, Urbana, Champaign Co., IL. In 1959, Anna was Associate Professor, Emerita. John C. Searl: Born February 17, 1891, in Morland, Solomon Co., KS; Died November 9, 1960, in Unknown (age 69). Buried in Morland Cemetery, Graham Co., KS. Married about 1930 in Morland, Solomon Co., KS, to Susan E. "Susie" (McGraw) Pace: Born April 21, 1887, in Decatur, Benton Co., AR; Died January, 1964, in Unknown (age 76). Buried in Morland Cemetery, Graham Co., KS. Joseph Reece Pace was born March 13, 1886, in Rogers, Benton Co., AR, and died October 20, 1921, in Tucumcari, Quay Co., NM, at age 35. Buried in Mount Hope Cemetery, Afton, Ottawa Co., OK. His father is Thomas E. Pace, and his mother is Unknown Wyatt. Mary Lydia Searl: Born March 20, 1897, in Solomon Twp., Graham Co., KS; Died August 30, 1976, in Tallahassee, Leon Co., FL (age 79). Never married. Maude E. Searl: Born October 6, 1902, in Solomon Twp., Graham Co., KS; Died March 21, 2001, at Dawson Place Nursing Home, Hill City, Graham Co., KS (age 98). Buried in Wildhorse Township Cemetery, Bogue, Graham Co., KS. Married June 14, 1925, in Morland, Solomon Co., KS, to Charles Nelson Clark: Born August 13, 1897, in Clarksridge, AR; Died March 7, 1994, at Graham County Hospital, Graham Co., KS (age 95). Buried in Wildhorse Township Cemetery, Bogue, Graham Co., KS. Virgil Dean Lambotte and Revean Vivian (Pace) Lambotte are buried in Dover Cemetery, Dover, Shawnee Co., KS. Thanks to Find-A-Grave for making this image available. 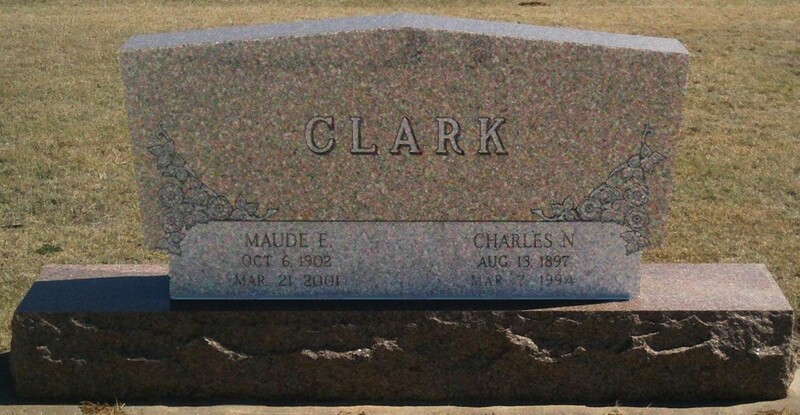 Charles Nelson Clark and Maude E. (Searl) Clark are buried in Wildhorse Township Cemetery, Bogue, Graham Co., KS. Thanks to Find-A-Grave for making this image available. An interesting newspaper article about the Steve Searl Homestead. The 1840 U. S. Census taken on 1840, shows Joseph Hockersmith is the Head of Household, and is living in Jessamine Co., KY. There are a total of 1 Male age 20 - 29; 1 Female under age 5; and 1 Female age 20 - 29. The 1850 U. S. Census taken on September 3, 1850, shows Joseph C. Hockensmith (age 29) born in Kentucky, and with real estate of $600 is a Gun Smith, and is living in Craig Twp., Switzerland Co., IN. Living with are: a female, Matsy Hockensmith (age 60) born in Kentucky; a male, Isaac D. Hockensmith (age 24) born in Kentucky; a female, Olevia Hockensmith (age 19) born in Kentucky; a male, M. J. Isaac Hockensmith (age 11) born in Iowa; and a male, D. S. Isaac Hockensmith (age 2/12) born in Iowa. John E. T. Hockensmith was born February 20, 1858, in Prestonville, Carroll Co., KY. His parents are Joseph Hockensmith and Winna Ann Malin. About 1858, John Searl and family removed from Fond du Lac Co., WI, to Franklin Twp., DeKalb Co., IL. 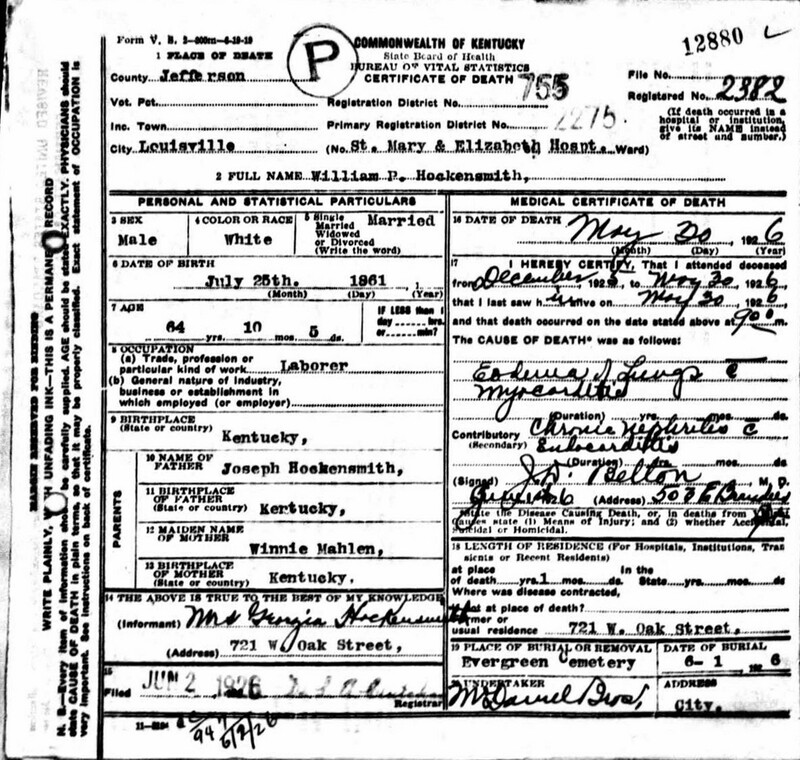 James Cadwalader Hawkersmith was born May 15, 1859, in Henry Co., KY. His parents are J. C. Hawkersmith and Malin. Stephen L. "Steve" Searl was born February 9, 1862, in Franklin Twp., DeKalb Co., IL. The 1860 U. S. Census taken on June 15, 1860, shows J. C. Hockersmith (age 38) born in Kentucky, and with personal estate of $100 is a Blacksmith, and is living in District No. 2, Carroll Co., KY. 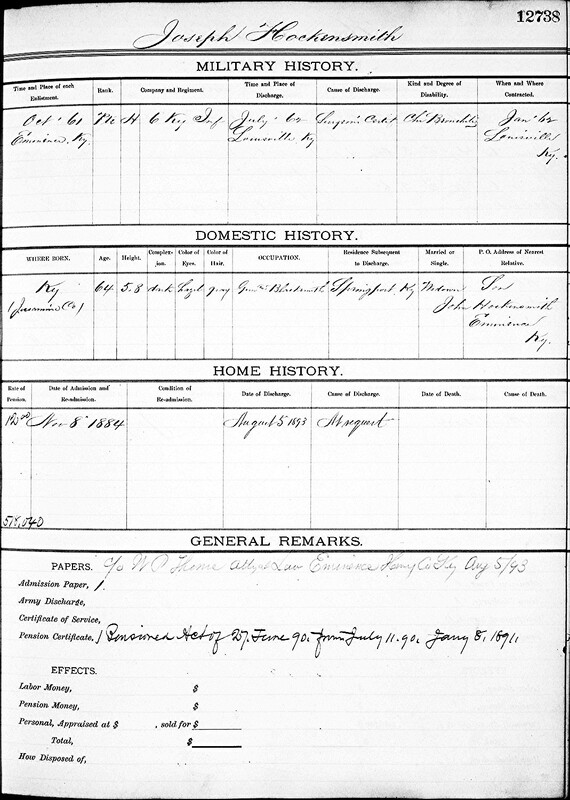 Living with are the following, all born in Kentucky: Winnie A. Hockersmith (age 20); John E. Hockersmith (age 2); and James C. Hockersmith (age 10/12). The 1860 U. S. Census taken on September 1, 1860, shows John Searles (age 40) born in Ireland with real estate of $800 and personal estate of $530 is a Farmer living in Franklin Twp., DeKalb Co., IL. Living with him is Eliza Searles (age 27) born in Canada, a Housekeeper. Also living there are seven Searles children, all born in Canada except for Mary, who was born in Wisconsin: Matilda Searles (age 15); John Searles (age 13); Christopher Searles (age 11); Eliza A. Searles (age 9); Thomas Searles (age 7); Robert Searles (age 6); and Mary Searles (age 3). 1861 Census for Durham County shows John Sorel (age 15) born in Upper Canada is a Servant living in Clarke Twp., Durham Co., Ontario, Canada. William Preston Hockensmith was born July 25, 1861, in Shelby Co., KY. His parents are Joseph Hockensmith and Winnie Mahlen. Hannah E. "Jennie" Hockersmith was born April 9, 1863, in Frankfort, Carroll Co., KY.
Georgia N. Pollard was born February, 1865, in Henry Co., KY.
About 1868, John Searl and family removed from Franklin Twp., DeKalb Co., IL, to Douglass Twp., Bremer Co., IA. The 1870 U. S. Census taken on June 7, 1870, shows Joseph C. Hockersmith (age 49) born in Kentucky is a Gunsmith and is living in Drennons Ridge Pct., Henry Co., KY. Living with are the following, all born in Kentucky: Winnie A. Hockersmith (age 29) with personal estate of $250, who is Keeping House; Preston Hockersmith (age 8); and Hannah S. Hockersmith (age 6). Preston may be William Preston Hockensmith, who died 1926 in Louisville, Jefferson Co., KY. The 1870 U. S. Census taken on July 15, 1870, shows John Searl (age 49) born in England with real estate of $1,000 and personal estate of $500 is a Farmer living in Douglass Twp., Bremer Co., IA. Living with him is Catharine Searl (age 53) born in New Jersey, who is Keeping House. Also living there is Stephen S. Searl (age 8) born in Illinois. About 1872, the John Searl family moved from Douglass Twp., Bremer Co., IA, to Austin. TX, where Stephen Searl was educated and learned the trade of a stone mason. About 1879, the John Searl family moved from Austin, TX, to Millbrook, Graham Co., KS. The 1880 U. S. Census taken on June 14, 1880, shows James David (age 52) born in Kentucky to Kentucky-born parents, is a married male Farming, and is living in Franklinton Dist., Henry Co., KY. Living with him are: a married female, Lyddia David (age 43) born in Kentucky to Kentucky-born parents, who is Keeping House; an unmarried male, Dillon David (age 22) born in Kentucky to Kentucky-born parents, who Works on Farm; an unmarried male, Edmond T. David (age 20) born in Kentucky to Kentucky-born parents, who Works on Farm; and an unmarried female, Hannah Hockersmith (age 17) born in Kentucky to Kentucky-born parents, a Servant. The 1880 U. S. Census taken on June 2, 1880, shows J. C. Hockersmith (age 62) born in Kentucky to Kentucky-born parents, is a Blacksmith, and is Boarding in Port Royal, Henry Co., KY. The 1880 U. S. Census taken on June 11, 1880, shows John E. Hockersmith (age 22) born in Kentucky to Kentucky-born parents, is an unmarried Farm Laborer, and is living in Franklinton Dist., Henry Co., KY. Living with him is an unmarried male, Herbert Carr (age 19) born in Kentucky to Kentucky-born parents, is an unmarried Farm Laborer who Works on Farm. 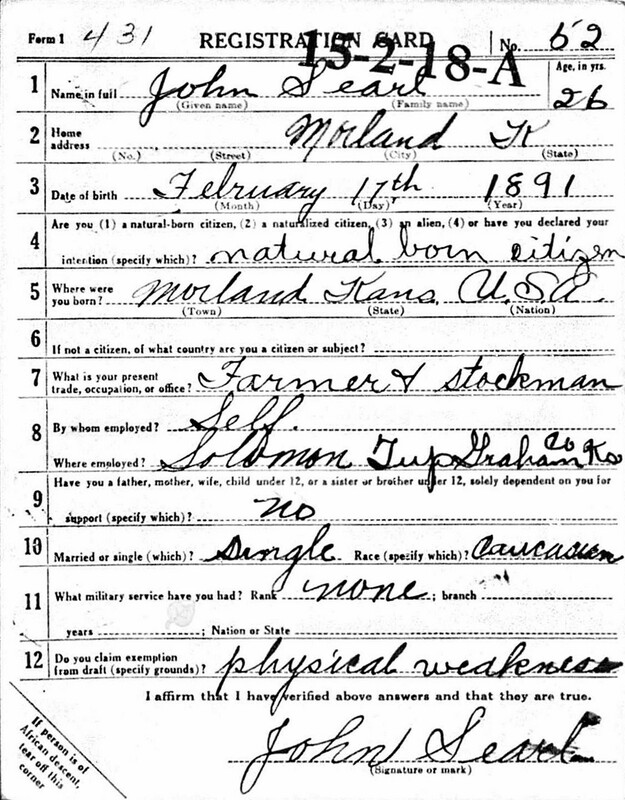 The 1880 U. S. Census taken on June 4, 1880, shows John Searl (age 60) born in England to English-born parents is a Stone Mason living in Millbrook, Graham Co., KS. Living with him is his wife, Catharine Searl (age 63) born in Massachusetts to Massachusetts-born parents, who is Keeping House. The 1880 U. S. Census taken on June 14, 1880, shows David James (age 52) born in Kentucky to Kentucky-born parents is a Farmer and is living in Franklinton Twp., Henry Co., KY. Living with him is his wife, Lyddia James (age 43) born in Kentucky to Kentucky-born parents, who is Keeping House. Also living there are three unmarried adults, all born in Kentucky to Kentucky-born parents: Dillon James (age 22), who Works on Farm; Edmond T. James (age 20), who Works on Farm; and Hannah Hockersmith (age 17), a Servant. In 1882, Stephen Searl came to Graham Co., KS. Joseph C. "Joe" Hockersmith entered the United States National Home for Disabled Volunteer Soldiers at Dayton, Montgomery Co., OH, on November 8, 1884. Joseph C. "Joe" Hockersmith Old Soldiers Home Record. J. C. Hockersmith and Florence Yager were married March 2, 1885, in Jefferson Co., KY. In 1884, 1885 and 1886, Steve Searl is a Stonemason on the Capitol Building payroll in Austin, TX. The 1885 Kansas State Census taken on March 1, 1885, shows John Searle (age 64) born in Foreign and having moved to Kansas from Iowa is a Farmer living in Millbrook Twp., Graham Co., KS. Living with him is Catherine Searl (age 67) born in New Jersey and having moved to Kansas from Iowa. Joseph Reece Pace was born March 13, 1886, in Rogers, Benton Co., AR. Susan E. "Susie" McGraw was born April 21, 1887, in Decatur, Benton Co., AR. William Preston Hockensmith and Georgia N. Pollard were married 1888 in Kentucky. John Searl died September 21, 1888, in Unknown at age 67. Buried in Morland Cemetery, Graham Co., KS. Stephen L. "Steve" Searl and Hannah E. "Jennie" Hockersmith were married December 25, 1888, in Morland, Graham Co., KS. Married - December 25, 1888, by Rev. J. Shaw, at the bride's home, Mr. Stephen Searl and Miss Hannah E. Hockersmith, all of Graham County Kansas. By 1890, Stephen L. Searl is back in Kansas, had married, had a daughter, and was living where his father had lived. 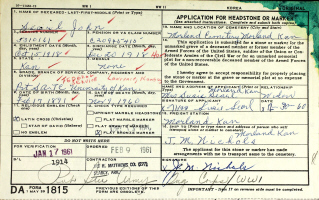 Joseph C. "Joe" Hockersmith was discharged from the United States National Home for Disabled Volunteer Soldiers at Dayton, OH, on August 5, 1893, at the request of his son, John Hockersmith, of Eminence, Henry Co., KY. 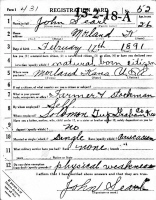 The 1895 Kansas State Census taken on March 1, 1895, shows S. L. Searl (age 33) born in Illinois and having moved to Kansas from Texas is a Stone Mason and Tenent living in Solomon Twp., Graham Co., KS. Living with him is Hannah Searl (age 32) born in Kentucky and having moved to Kansas from Kentucky. Also living there are two Searl children, both born in Kansas: Anna Searl (age 5); and John Searl (age 4). The 1900 U. S. Census taken on June 5, 1900, shows Wm. P. Hockensmith (age 38) born July, 1861, in Kentucky to Kentucky-born parents is a married Farm Laborer, and who is renting his home, and is living in Doaks Pct., Shelby Co., KY. Living with him are: his wife of 12 years, Georgia A. Hockensmith (age 35) born February, 1865, in Kentucky to Kentucky-born parents, with 2 of the 3 children born to her still alive; his son, Curtis B. Hockensmith (age 8) born September, 1891, in Kentucky to Kentucky-born parents; his daughter, Verda Hockensmith (age 5) born November, 1894, in Kentucky to Kentucky-born parents; his widower brother, John E. Hockensmith (age 42) born February, 1858, in Kentucky to Kentucky-born parents, a Farm Laborer; and an unmarried male Servant, Wm. H. Walker (age 30) born March, 1870, in Kentucky to Kentucky-born parents, a Farm Laborer. The 1900 U. S. Census taken on June 23, 1900, shows Stephen Searls (age 38) born February 1862 in Illinois to English and Scottish-born parents is a Stone Mason owning his own farm with a mortgage and living in Solomon Twp., Graham Co., KS. Living with him is his wife of 11 years, Hannah Searls (age 37) born April 1863 in Kentucky to Indiana and Kentucky-born parents, with all 3 of the children born to her still alive. Also living there are his 3 unmarried children, all born in Kansas to Illinois and Kentucky-born parents: Annie Searls (age 10) born November 1889; John Searls (age 9) born February 1891; and Mary Searls (age 3) born March 1897. The 1900 U. S. Census taken on June 23, 1900, shows John C. McGraw (age 47) born June, 1842, in Mississippi to Tennessee-born parents, is a married Farmer, and who rents his farm, and is living in Cherokee Nation County, Indian Territory. Living with him are: his wife of 29 years, Linda McGraw (age 47) born April, 1853, in Tennessee to Tennessee-born parents, and with 6 of the 8 children born to her still alive; his daughter, Susan McGraw (age 13) born April, 1887, in Arkansas to Mississippi and Tennessee-born parents; his son, James S. McGraw (age 8) born August, 1891, in Arkansas to Mississippi and Tennessee-born parents; and his son, Clifford P. McGraw (age 7) born May, 1893, in Arkansas to Mississippi and Tennessee-born parents. 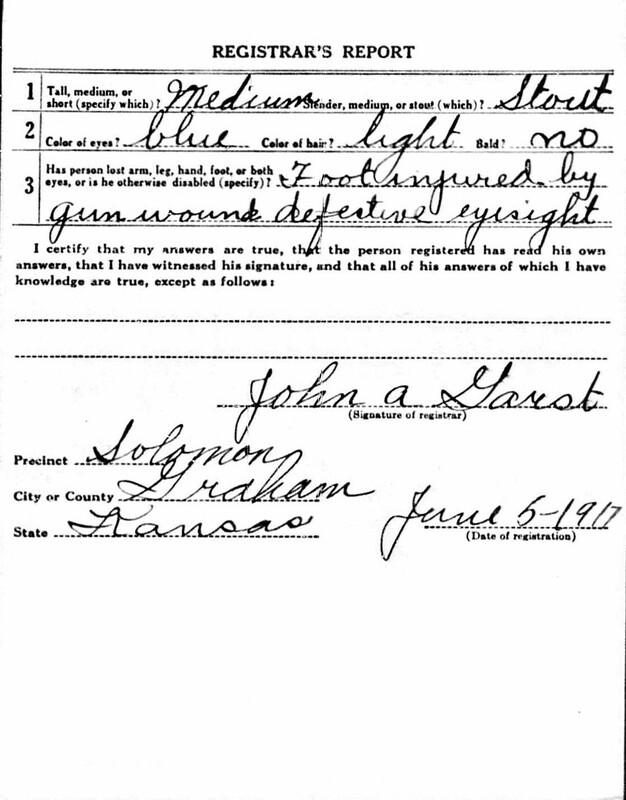 The 1905 Kansas State Census taken on March 1, 1905, shows S. L. Searl (age 43) born in Not Stated and having moved to Kansas from Not Stated is living in Solomon Twp., Graham Co., KS. Living with him is Jennie Searl (age 43) born in Not Stated and having moved to Kansas from Not Stated. Also living there are four Searl children, all born in Kansas: Anna Searl (age 14); John Searl (age 12), a Farmer; Mary Searl (age 8); and Maud Searl (age 2). WRITER AND ENGRAVER'S PICTURE OF GRAHAM COUNTY'S PROGRESS SINCE ITS ORGANIZATION, Frank Lee, Photographer. F. M. Steves & Sons, Printers, Topeka, KS. Michaelis Engraving Co., Kansas City, MO. 1906. The subject of this sketch was born in Illinois, and moved with his parents in boyhood to Austin. Texas, where he was educated and learned the trade of a stone mason. He came to Graham county in 1882 and his first contract was the Pomeroy Hotel. Then followed the F. and M. Bank, the Scherer Hotel and the Presbyterian church and manse. Though Mr. Searl found all the work he could do at his trade, he decided to become a farmer and homesteaded two and one-half miles southwest of Morland, in 1886. He made no mistake in the change and has been exceedingly prosperous. Mr. Searl owns 640 acres of land and has one and one-half section under lease. His entire farm is fenced. The dwelling is a story and a half stone structure surrounded by a beautiful fifteen acre grove of native trees. These trees are remarkable for their size, many of them, being forty inches in circumference. Mr. Searl has one of the best watered farms in the country. It is traversed by Sand creek and has some twenty-five springs. The valley along the mile and a half of Sand creek is fine alfalfa land. The water used in the house and stables is piped from the excellent springs. Mr. Searl has a large young orchard of 150 bearing trees. In 1905, 4000 bushels of corn were raised on this farm, which has not failed to produce a good crop of this grain since 1894. Mr. Searls has growing fifteen acres of red top grass, five acres of timothy and 60 acres of alfalfa. The farm is well adapted to stock raising with pasture and grain sufficient to fatten 150 head of cattle and 150 head of hogs, each year. In 1905, a car load of fat cattle and hogs was shipped from the place. The improvements on the farm are worth some $4, out), and the land is valued at $20 an acre. Mr. Searls was married December 25, 1883 to Miss Hannah Hockersmith, and to this union four children were born. The 1910 U. S. Census taken on May 9, 1910, shows Steven L. Searl (age 48) born in Illinois to English and Scottish/Irish-born parents is a Stone Mason and Farmer owning his own farm free of a mortgage and living in Solomon Twp., Graham Co., KS. Living with him is his wife of 21 years, Hanna E. Searl (age 47) born in Kentucky to Indiana and Kentucky-born parents, with all 4 of the children born to her still alive, who is a House Parrey at Home. Also living there are his 4 unmarried children, all born in Kansas to Illinois and Kentucky-born parents: Anna W. Searl (age 20), a School Teacher in the Common Schools; John C. Searl (age 18), a Farmer on the Home Farm; Mary L. Searl (age 13); and Maude E. Searl (age 7). 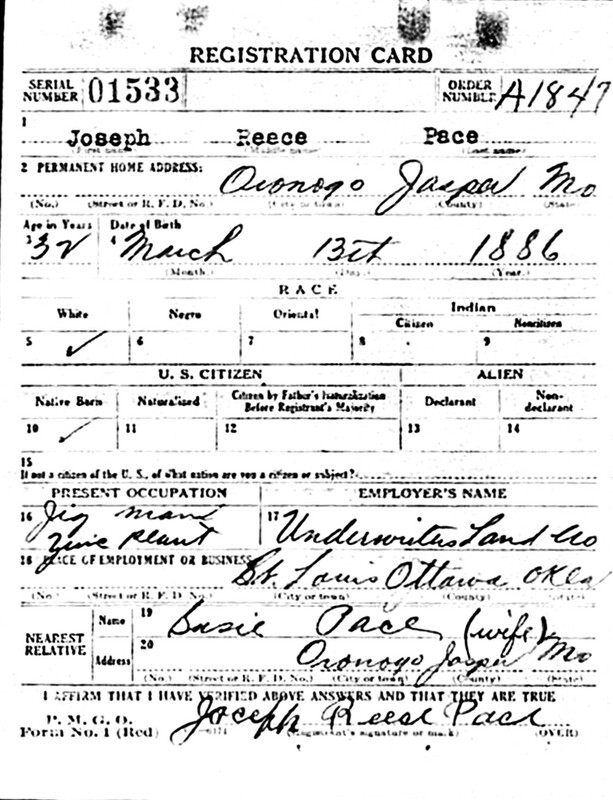 In 1910, J. R. Pace (age 24) is an unmarried Hired Man Farm Laborer who is living in Township 6, Delaware Co., OK. 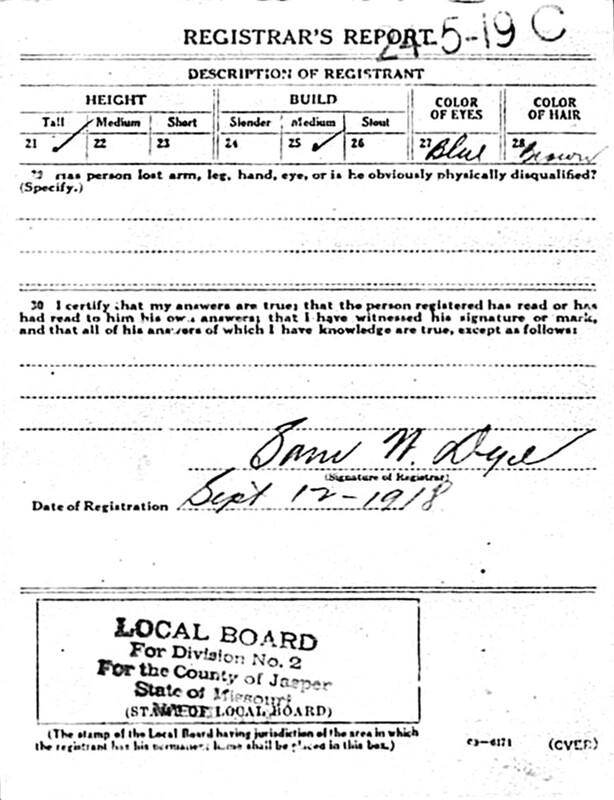 The 1910 U. S. Census taken on April 16, 1910, shows John C. McGraw (age 68) born in Mississippi to Tennessee-born parents, is a married Head of Household, and who is in his first marriage, and who owns his farm free of a mortgage, and is living in Afton, Afton Twp., Ottawa Co., OK. Living with him are: his wife of 38 years, Bindie McGraw (age 56) born in Tennessee to Tennessee-born parents, and in her first marriage, and with 5 of the 8 children born to her still alive; his unmarried daughter, Susan McGraw (age 22) born in Arkansas to Mississippi and Tennessee-born parents; his unmarried son, James McGraw (age 19) born in Arkansas to Mississippi and Tennessee-born parents, a Watchman on a Railroad; and his unmarried son, Clifford McGraw (age 16) born in Arkansas to Mississippi and Tennessee-born parents. Revean Vivian Pace was born June 23, 1912, in Missouri. The old grade school building at Morland was destroyed by fire early Thanksgiving morning. Fire was first discovered about 5:30 a.m. and had made such headway that it was too late to save the building or any of the contents. Due to a strong southeast wind the blaze caused considerable danger to nearby residents. The Avon Burns house was in a very bad location and Mr. Burns worked hard to save his new home, where hot shingles and sparks fell on the house. Many other parts of town also had to be protected from the sparks. 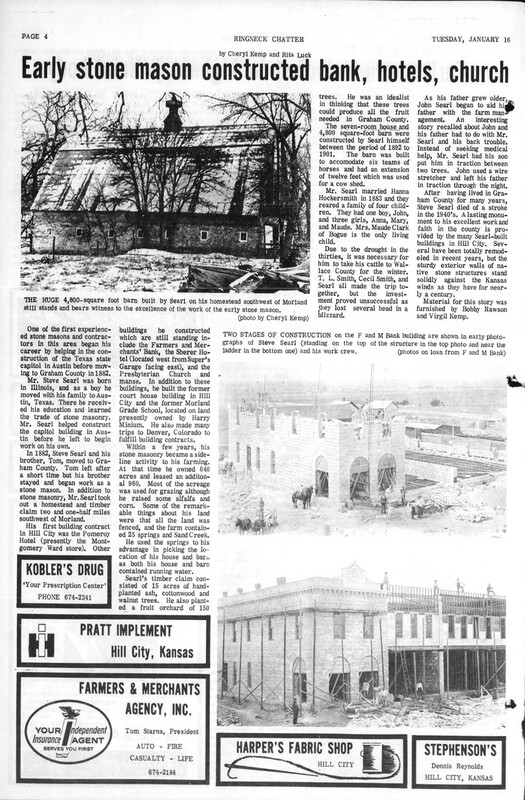 The building was a two-story stone structure which was built in 1912 by John Searl's father, Steve Searl. It consisted of four rooms, two upstairs and two down. The larger per cent of Morland and surrounding citizens received their education in the schoolhouse. Harry Minium recently purchased the building and it was used for storage. At the time of the fire, it contained about 1000 bales of alfalfa which he had purchased. It means quite a loss to Mr. Minium and folks in Morland were sorry to see this old landmark for some many years, destroyed by fire. Virgil Dean Lambotte was born January 27, 1914, in Dover, Mission Twp., Shawnee Co, KS. The 1915 Kansas State Census taken on March 1, 1915, shows S. L. Searl (age 53) born in Illinois and having moved to Kansas from Texas is a Farmer owning his own home free of a mortgage and is living in Solomon Twp., Graham Co., KS. Living with him is J. E. Searl (age 52) born in Kentucky and having moved to Kansas from Kentucky, who is a House Wife. Also living there are three Searl children, all born in Kansas: John Searl (age 24), a Farmer; Mary Searl (age 18); and Maudie Searl (age 12). 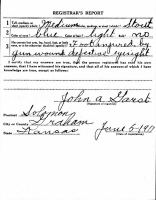 The WWI Draft Registration Report dated June 5, 1917, shows John Searl, born February 17, 1891, in Morland, KS, is living Solomon Twp., Graham Co., KS. 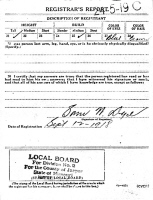 John Searl WWI Draft Registration Report. 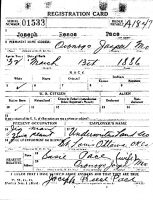 The WWI Draft Registration Report dated September 12, 1918, shows Joseph Reece Pace was born March 13, 1886, and is living in Oronogo, Jasper Co., MO, but is employed as a Jig Man in a Zinc Plant in St. Louis, Ottawa Co., OK.
Joseph Reece Pace WWI Draft Registration Report. The 1920 U. S. Census taken on January 27, 1920, shows Steven L. Searl (age 58) born in Illinois to English and Scottish-born parents is a Farmer owning his own farm with a mortgage and living in Solomon Twp., Graham Co., KS. Living with him is his wife, Hanna Searl (age 57) born in Kentucky to Indiana and Kentucky-born parents. Also living there are his two unmarried children, both born in Kansas to Illinois and Kentucky-born parents: John C. Searl (age 28), who is Farming at Home; and Maude Searl (age 17). The 1920 U. S. Census taken on February 4, 1920, shows Joseph R. Pace (age 33) born in Arkansas to Arkansas and Texas-born parents is a General Farmer who rents his farm and is living in Mounds Twp., Creek Co., OK. Living with him is his wife, Susie Pace (age 32) born in Arkansas to Mississippi and Tennessee-born parents. The 1920 U. S. Census taken on January 7, 1920, shows Thomas E. Pace (age 27) born in Missouri to Missouri-born parents, is a married General Farm Farmer, and who owns his farm with a mortgage, and is living in Baker Twp., Linn Co., MO. Living with him are: is his wife, Lora Alma Pace (age 28) born in Missouri to Missouri and Iowa-born parents; and his daughter, Vivian Pace (age 6) born in Missouri to Missouri-born parents. The 1920 U. S. Census taken on February 2, 1920, shows Anna W. Searl (age 30) born in Kansas to Illinois and Kentucky-born parents is an unmarried Public School Teacher who is lodging in the Town of Bainville, Roosevelt Co., MT. Joseph Reece Pace died October 20, 1921, in Tucumcari, Quay Co., NM, at age 35. Buried in Mount Hope Cemetery, Afton, Ottawa Co., OK.
Hannah E. "Jennie" (Hockersmith) Searl died January 1, 1924, in Pontiac, Livingston Co., IL, at age 60. Buried in Morland Cemetery, Graham Co., KS. The 1925 Kansas State Census taken on March 1, 1925, shows S. L. Searl (age 63) born in Illinois, and having moved to Kansas from Texas, is a widowed Farmer owning his own home free of a mortgage, and is living in Solomon, Graham Co., KS. Living with him is his unmarried daughter, Maude Searl (age 22) born in Kansas, a Teacher. 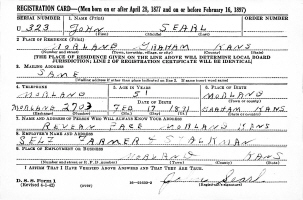 The 1925 Kansas State Census taken on March 1, 1925, shows John Searl (age 34) born in Kansas is an unmarried Farmer owning his own home with a mortgage and is living in Solomon, Graham Co., KS. The 1925 Kansas State Census taken on March 1, 1925, shows Susie Pace (age 37) born in Arkansas, and having moved to Kansas from Missouri, is a widowed House Keeper, , and is living in Solomon, Graham Co., KS. Living with her is her daughter, Ravean Pace (age 12) born in Mossouri, and having moved to Kansas from Missouri. William Preston Hockensmith died May 30, 1926, in Louisville, Jefferson Co., KY, at age 64. 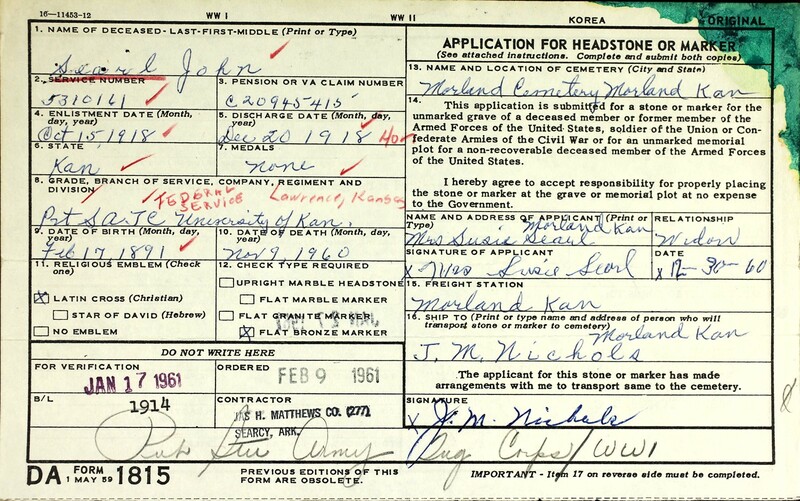 William Preston Hockensmith Death Certificate. The 1930 U. S. Census taken on April 18, 1930, shows Stephen L. Searl (age 68) born in Illinois to English and Scottish-born parents is a General Farm Farmer owning his own farm and living in Solomon Twp., Graham Co., KS. Living with him is his unmarried son, John Searl (age 39) born in Kansas to Illinois and Kentucky-born parents, who is a General Farm Farmer. Also living there are a widowed Housekeeper and her two unmarried children. The 1930 U. S. Census taken on April 14, 1930, shows Susie E. Pace (age 42) born in Arkansas to English and Scottish-born parents is a widowed Cafe Waitress who rents her home for $8/month and is living on Sumner Street, City of Morland, Solomon Twp., Graham Co., KS. Living with her is her unmarried daughter, Revean Pace (age 17) born in born in Missouri to Arkansas-born parents. 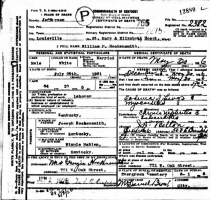 The 1930 U. S. Census taken on April 3, 1930, shows Anna W. Searl (age 40) born in Kansas to Illinois and Kentucky-born parents is an unmarried U. S. Department Agent who is boarding at 206 Madison, 4th Ward, City of Pontiac, Livingston Co., IL. John Searl and Susan E. "Susie" (Unknown) Pace were married about 1930 in Morland, Solomon Co., KS. 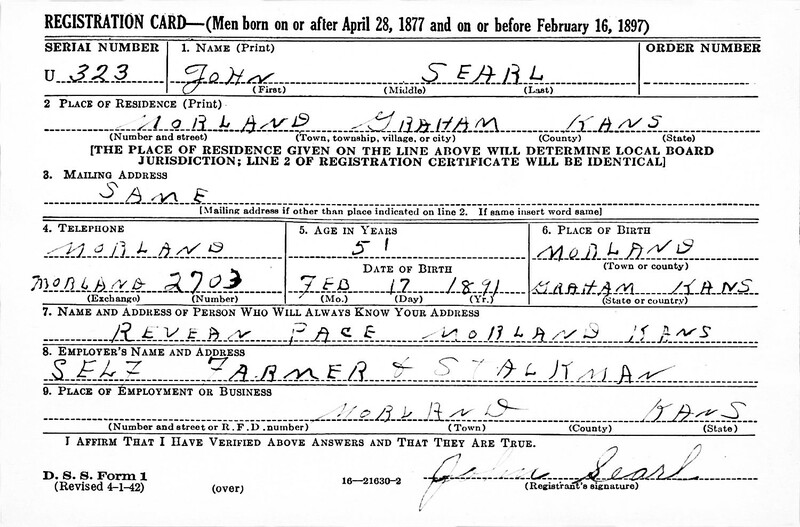 The 1930 State of Kansas World War Veteran Medical Enrollment Report shows John Searl, is living Morland, Graham Co., KS. 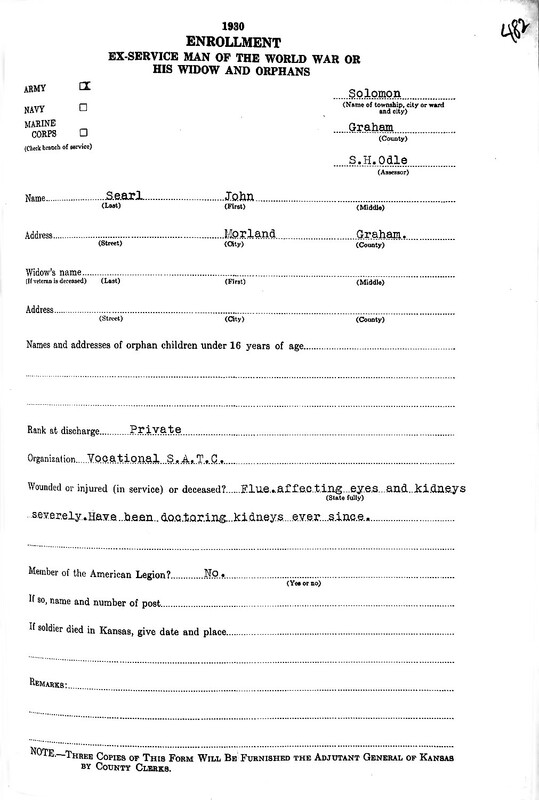 John Searl WWII Draft Registration Report. The 1940 U. S. Census taken on April 15, 1940, shows Stephen L. Searl (age 79) born in Illinois, and 5 years ago was living in the Same House, and with 4 years of School, is a widower Farming Farmer who owns his farm and is living in Solomon Twp., Graham Co., KS. Living with him are: his married son, John Searl (age 49) born in Kansas, and 5 years ago was living in the Same House, and with 8 years of School, a Farming Farmer; his daughter-in-law, Susie E. Searl (age 52) born in Arkansas, and 5 years ago was living in the Same House, and with 6 years of School; and his unmarried step-granddaughter, Revean Pace (age 27) born in Missouri, and 5 years ago was living in the Same House, and with 4 years of High School. The 1940 U. S. Census taken on April 10, 1940, shows Anna W. Searl (age 50) born in Kansas, and 5 years ago was living in Pontiac, IL, and with 5 years of College, is an unmarried Home Economics Teacher at a University who is renting her home for $65/month and is living at 1208 West California, City of Urbana, Cunningham Twp., Champaign Co., IL. Living with her are: her unmarried sister, Mary L. Searl (age 43) born in Kansas, and 5 years ago was living in New York, NY, and with 4 years of High School, a Registered Nurse in a Hospital; an unmarried lodger, Ramona L. Huber (age 34) born in Illinois, and 5 years ago was living in Pontiac, IL, and with 4 years of High School, an Insurance Stenographer; and an unmarried lodger, Mabel M. MacMasters (age 35) born in New York, and 5 years ago was living in was living in Amherst, MA, , IL, and with 6 years of College, a Research Chemist at a University. Stephen L. Searl died 1940 in Solomon Twp., Graham Co., KS, at about age 78. 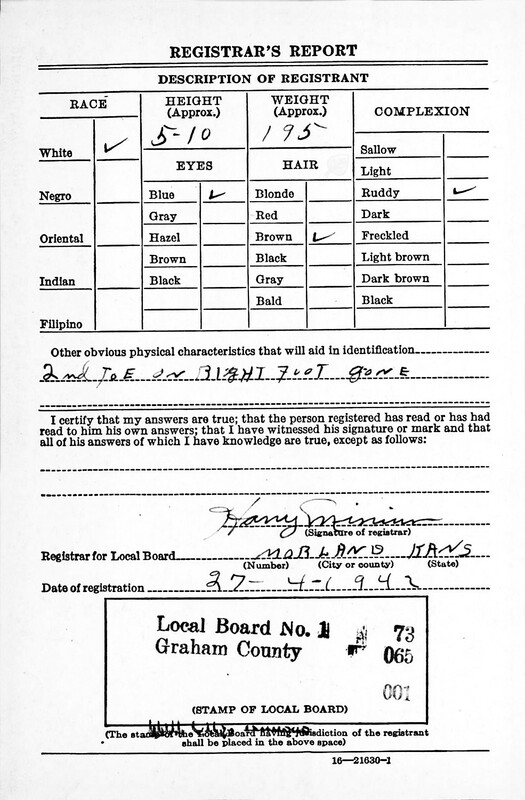 The WWII Draft Registration Report dated April 27, 1942, shows John Searl, born February 17, 1891, in Morland, KS, is living Solomon Twp., Graham Co., KS. In 1950, the Urbana City Directory shows Anna Searl is listed as a prof at U of I, and is the head of household, and is living at 1208 W. California, Apt. 4 U, Urbana, Champaign Co., IL. Living with her is Mary L. Searl, a nurse. Georgia N. Pollard Hockensmith died May 28, 1959, in Okolona, Jefferson Co., KY, at age 94. John Searl died November 9, 1960, in Unknown, at age 69. Buried in Morland Cemetery, Graham Co., KS. Virgil Dean Lambotte and Revean Vivian Pace are buried in Dover Cemetery, Dover, Shawnee Co., KS. 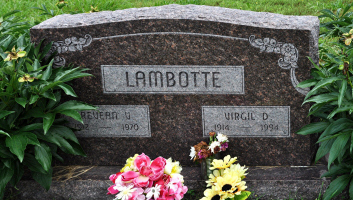 Revean Vivian (Pace) Lambotte died November 3, 1970, in Topeka, Shawnee Co, KS, at age 58. Buried in Dover Cemetery, Dover, Shawnee Co., KS. Virgil Dean Lambotte died May 5, 1994, in Olathe, Johnson Co., KS, at age 80. Buried in Dover Cemetery, Dover, Shawnee Co., KS. Revean Vivian Pace was born June 23, 1912, in Missouri, and died November 3, 1970, in Topeka, Shawnee Co, KS, at age 58. Buried in Dover Cemetery, Dover, Shawnee Co., KS. Married 1950 - 1954 in Topeka, KS, to Virgil Dean Lambotte: Born January 27, 1914, in Dover, Mission Twp., Shawnee Co, KS; Died May 5, 1994, in Olathe, Johnson Co., KS (age 80). Buried in Dover Cemetery, Dover, Shawnee Co., KS. High School Class of 1931 in Morland, Soloman Co., KS. 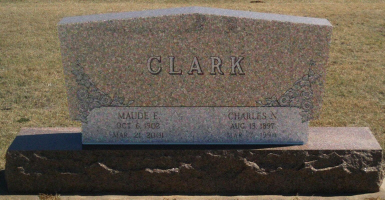 Maude E. (Searl) Clark died March 21, 2001, at Dawson Place Nursing Home, Hill City, Graham Co., KS (age 98). Buried in Wildhorse Township Cemetery, Bogue, Graham Co., KS. HILL CITY - Maude E. Clark, 98, Hill City, died Wednesday, March 21, 2001, at Dawson Place Nursing Home, Hill City. Mrs. Clark was born Maude E. Searl on Oct. 6, 1902, at rural Graham County and was a longtime resident of the Bouge area. She was a homemaker and a bookkeeper. She was a member of Bouge United Methodist Church and was active in Young Women's Christian Association, Home Demonstration Unit Unit and 4-H Club. She was also a member of Wednesday Morning Prayer Group. Her husband, Nelson, died in 1994. Survivors include a son, Phillip N. of Bouge; a daughter, Phyllis M. Maier of Independence, Mo. ; three grandchildren; and five great-grandchildren. The funeral will be at 10 a.m. Monday at Bouge United Methodist Church, the Revs. Mehl Cruit and Terry Allison officiating. Burial will be in Wildhorse Township Cemetery, Bouge. Memorials may be made to Graham County Library. Visitation will be from 2 to 8 p.m. Sunday at Spencer-Stinemetz Chapel of Hill City, 522 N. Pomeroy, Hill City 67642 and 9 a.m. until the service Monday at the church.